I saw a single stalk bearing these white flowers sticking out of a green meadow some distance away. It was foggy on the Kaas plateau. 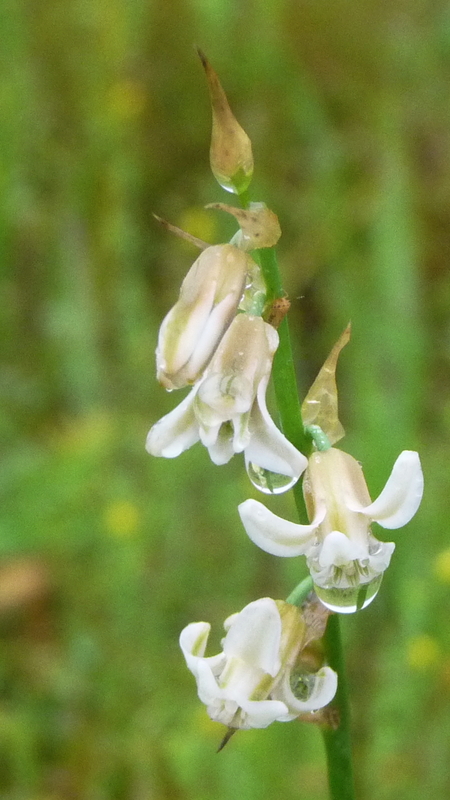 The rain had left little droplets of water suspended from the flowers. As I tried to take photos, I thought that they reminded me of lilies. Later I wasn’t sure whether it was a lily or a confusingly similar orchid. I thought I would see it again elsewhere, but didn’t come across it later. As a result, this somewhat noisy photo is the only one I have. When I eventually identified it as Dipcadi montanum (conflated with D. ursulae by Ingalhalikar), it turned out that its classification is contentious. It used to be placed in the family Liliaceae. By the time Ingalhalikar wrote his book it had been moved to family Asparagaceae. Recent papers split off the subfamily and class it as a separate family Hyacinthaceae. I’ll go with this. Classification of angiosperms is being transformed by molecular data, so the older classifications are never going to come back. This herb is said to be widespread but rare and endangered. Its claimed rarity agrees with my personal observation. In India it has been reported from various parts of Maharashtra, Karnataka, Tamil Nadu, Orissa, Bihar, Punjab, and Himachal Pradesh. Eflora India has photos which show bladderwort (Utricularia) growing nearby. Interestingly, my only photo of bladderwort came from the same patch where I saw these flowers. Is there really some connection between them? At the other end of the scale of rarity were chest-high bushes of the common hill borage, with the double-barrelled name of Adelocaryum coelestinum. The pale blue flowers of this forget-me-not (family Boraginaceae) grow along long stalks, as in the featured photo. The tiny five-petalled white flowers have a beautiful blue center. They are widely spotted in Maharashtra and Goa, but probably also grow in neighbouring states, including arid Gujarat. I lumped these two together because I couldn’t find any documented use for them, neither as remedies against disease, nor as food. As of now, it seems that they are just beautiful flowers which we can enjoy looking at.